TurboFlex Pro is a new patent pending development of Turbosand. TurboFlex Pro is a brush-backed abrasive ﬂap sander, but with a new feature. The brush and the abrasive are proﬁled to match your proﬁle. This feature produces a higher quality and more uniform sanding of a proﬁled surface, but does not over sand high spots or round mitered corners as is typical of straight line or non-proﬁled ﬂap sanders. After the abrasive wears away, the abrasive reﬁll can be indexed to expose fresh abrasive without replacing. After the second abrasive surface is worn, only the abrasive needs to be replaced and the brush can be used again and again. 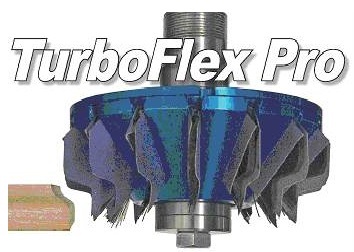 TurboFlex Pro is available in many head conﬁgurations with grits from 120 to 220. The brushes are available in three different levels of stiffness allowing for ﬁne ﬁnishing to aggressive surfacing. TurboFlex Pro is much easier to setup and align than solid sanding devices and delivers a much more uniform ﬁnish. The sanding cost per foot is extremely low due to the tremendous life of the abrasive and the indexing feature.